CORDIO East Africa is a research and conservation organisation focused on marine and coastal ecosystems in the Western Indian Ocean (WIO). We specialise in generating knowledge to find solutions that benefit both ecosystems and people. CORDIO’s priority focus is on coral reefs, covering a range of topics including climate change, resilience, long term monitoring, artisanal fisheries, community based management approaches, climate change adaptation and endangered species protection. We choose coral reefs because they are the most biodiverse marine ecosystem, they are extremely vulnerable to global warming, they are a ubiquitous and substantial component of the marine environment in the WIO, and are of vital importance in sustaining livelihoods and economies in the coastal zone. 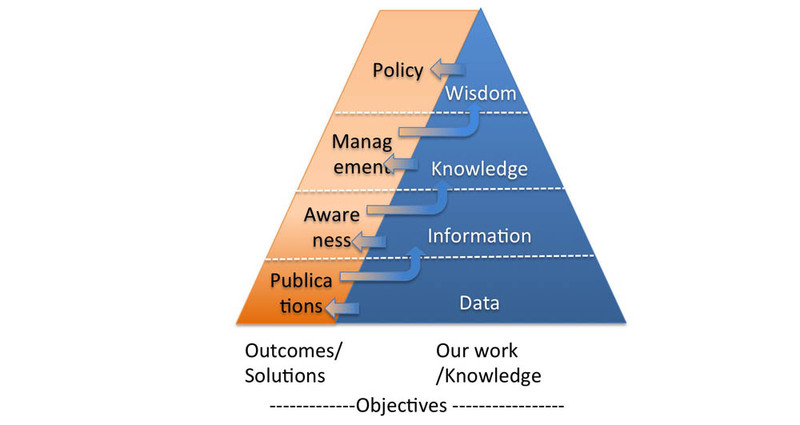 at each level, outcomes must be derived from our work – from data to publishing, from information to awareness, from knowledge to management and from wisdom to policy. Each project may work in just a sub-section of the pyramid, but these basic premises – upward and outward – guide all our work. 1) Knowledge – to generate new knowledge through primary research, and improve access to knowledge through linking to, synthesizing and explicating existing knowledge – from data to information to knowledge to wisdom. 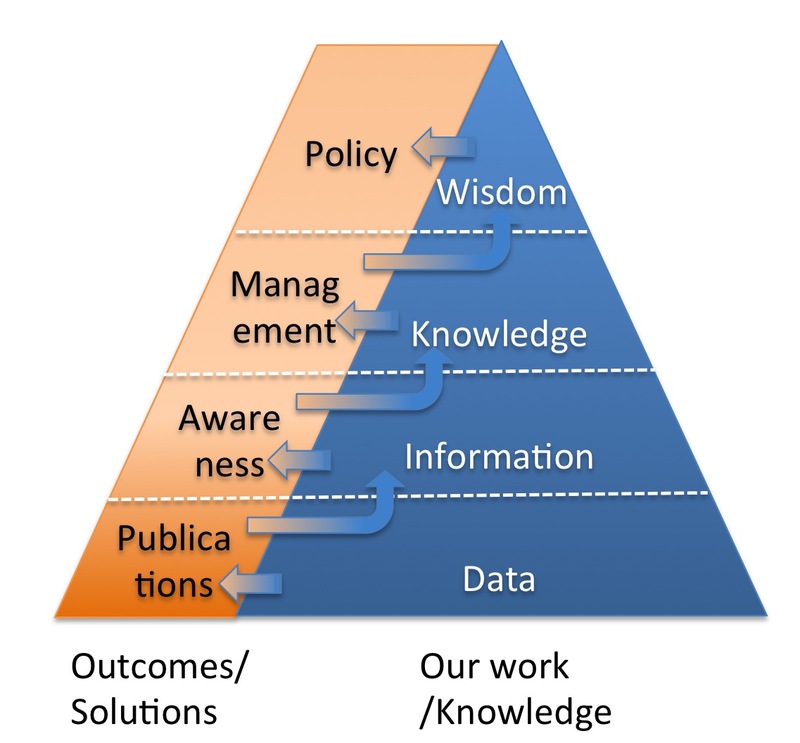 2) Solutions/Outcomes – to generate outcomes our work needs to be valorized, with specific tools or outreach for each stage in the knowledge pyramid – from data to publishing, from information to awareness, from knowledge to management and from wisdom to policy. 3) Local Action – at local scales, we work to implement conservation on the ground; empowering coastal communities with a focus on education, raising awareness to enable management interventions, and influencing policy. 4) National Action – in the countries in which we work, we develop relationships with national institutions, nationally-recognized NGOs and leading scientists to help meet national objectives by scaling up from local actions, and scaling down from regional actions. 5) Regional Action – at larger scales determined by the dynamics of the WIO, we work to disseminate synthesized information for decision makers/change agents, raise awareness and support for management and policy interventions relevant to the larger scale. 6) Building capacity, the next generation – of marine scientists and decision-makers in East Africa, from community to government levels, of students, interns and others. 7) Partnerships and collaborations – no single organization can deliver the necessary change alone, thus we work with and through partners at all levels, at local, national and regional scales.